"Mukago" are small shoots sprouting from the stems of Japanese yam leaves, and rice cooked with them is called "Mukago rice". It is made by cooking Mukago, kelp, soy sauce or salt, sake and such with white rice, and is seasoned to the taste of each family. Mukago tastes a lot like Japanese yam and is fairly mild. Although it can be eaten raw, a more aromatic taste can be enjoyed by cooking it. Access Approx. 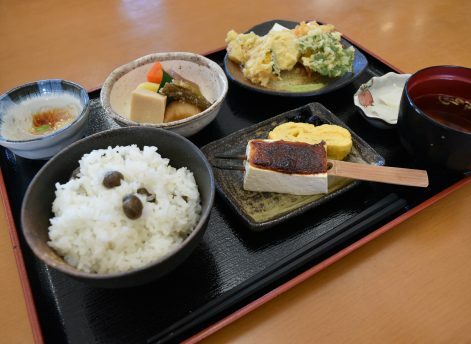 15 minutes by car from Chuo Expressway "Mizunami IC"
"Mukago Gohan Set Meal" featuring Mukago rice cooked with Mukago, a locally-harvested type of Japanese yam which has a strong viscosity, is a popular item on the menu, so good that it has repeat customers. Enjoy the texture of Mukago and the subtle scent of Japanese yam to your hearts' content. ＜Messages from the Staff＞ We try our best daily to improve and create more unique tastes through hearty and sincere cooking and team work. "Tokoroten" made using hosokanten, a specialty of Yamaoka-cho. Try our "kanten (agar) soft ice cream." Have a relaxing time in our restaurant in the abundant sunlight. The 24m-diameter wood water mill and Youn Bridge in the neighborhood are both worth seeing. Origawa Dam nearby is certified as "dam opened to the local community".